Director and Producer Roland Hoffman has been working hard on building a video of this year's Awards Breakfast. 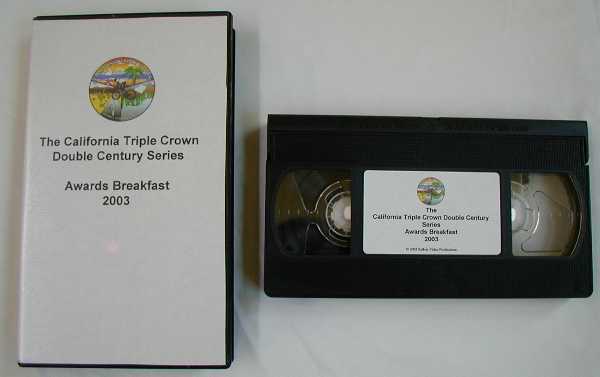 You'll be able to experience the memories, the laughs, and the inspiring moments by owning your own personal copy of the 2003 California Triple Crown Awards Breakfast on video!! All this for only $19 for a VHS copy. Or be the first on the block to own a DVD version for just $24 where you'll be able to smoothly freeze frame and view slow motion of all the action!! Thanks to Roland for making these videos. Available to anyone whether or not you've ever completed the California Triple Crown. Inventory is not a problem on this product due to short leadtimes. Manufactured by Roll-in Video Productions. Directed, Produced, and all proceeds to fellow California Triple Crown Winner Roland Hoffman.